Philippine President Rodrigo Duterte, in one of his signature curse-laden speeches, asked this question while lashing out at US-based Time Magazine for lumping him together with other “despots” in its cover story titled, "Rise of the Strongman”. But Duterte and Roque seem to live in different worlds as journalists, legislators, and human rights advocates here and abroad have voiced strong concern about creeping media repression in the Philippines. The Philippines slid 6 spots in the 2018 World Press Freedom Index by media watchdog Reporters Without Borders (RSF). The data also paints a dark picture of the state of press freedom in the country: in Duterte's first two years in power, journalists had to do their job while wading through murky waters of online attacks and insults hurled by his propaganda army not long after he became president. For instance, it was blogger Margaux “Mocha” Uson who was the first to aggressively push the term “presstitute,” a play on the words "press" and "prostitute" to denigrate the media. Given her followers that easily numbered in the millions, she was instrumental in the viral spread of the word. She would later be rewarded by the President for her efforts and given an appointment initially as board member of the Movie and Television Review and Classification Board (MTRCB) and subsequently Assistant Secretary of the Presidential Communications Operations Office (PCOO). Uson would use her strategic position as Communications assistant secretary, supported by government resources, to continue attacking the media. Data gathered by Rappler shows that she began with a meme posted on her blog at 4:45 am, Saturday, August 27, 2016, defining the term “presstitute”. Uson advised her followers to familiarize themselves with the meaning of the term because they would be using it frequently from then on. Exactly 17 minutes after Uson published her post, Rodrigo Duterte’s campaign spokesman Peter Tiu Laviña also used the term “presstitute” in another post where he attacked critics of the government's "war on drugs." Laviña's post included a photo of what he described as a 9-year-old girl who was raped and murdered. He said it was revolting that "we haven't heard [statements] condemning this brutal act from human rightists, bishops and 'presstitutes' who are derailing the government's war against drugs and crime." The photo Laviña posted later turned out to have been taken in 2014 in Brazil, and not the Philippines. Days before Uson and Laviña introduced the term to their followers, a few accounts which appeared to be those of Duterte supporters, repeatedly published posts already using the term in various Facebook groups. On August 25, a single account published 43 posts which used it too. But it was only after the two Duterte social media influencers, Uson and Laviña, published their respective posts, that the term went viral and became more sticky. Uson and Laviña's posts came days after Philippine National Police chief Ronald dela Rosa declared in a Senate hearing on extrajudicial killings that more people would surely die as the war on drugs continued. At the time, the PNP said there had been 756 killed in police operations and 1,160 outside police operations. The Senate investigation was triggered by news reports about a rise in vigilante killings. On the same day Uson posted the attack meme, she also posted a video where she interviewed former columnist Teddy Boy Locsin Jr about his thoughts on the “new” term. Locsin said his father used to call presstitutes simply as “prostitutes" and their publishers as "pimps”. Locsin said that “presstitute” is even more polite. "I’ll tell you one thing sa mga presstitutes: They never last long. Hindi naman pinapatay ah, pero puwede din 'yun. They don’t last long because 'yung credibility, that is the life of the journalist,” he said. "Presstitute" is not the only derogatory term that the President's supporters have routinely used against the press. Data collected by Rappler from public groups and pages on Facebook also shows a surge in the use of the words "bayaran" or bribed, "dilawan" or being pro-Liberal Party, and "bias" (rather than "biased") in the past couple of years. Following the initial attacks, Rappler started collecting data in 2016 to monitor and analyze the spread of disinformation and hateful speech online. As of March 2018, Rappler has been able to map and monitor a network of more than 400 interconnected public groups and pages. The data collected by the shark tank – tagged as such because of vicious language used by the accounts – shows that use of the term “presstitutes” in these groups and pages became significantly more frequent after Uson and Laviña used it on their own Facebook posts. Out of 285 groups monitored by Rappler, 194 used the word “presstitute” in posts. These 194 groups had a total of 6.57 million members, with an average overlap of 20% in membership among groups. At its peak, the term "presstitute" was used in almost 1,200 comments in a single day within these groups. After August, use of the term "presstitute" spiked again in September, after the Davao bombing and the subsequent signing by Duterte of the proclamation declaring a state of national emergency in the Philippines supposedly "on account of lawless violence". The series triggered further attacks, this time, specific to Rappler. They initiated a #UnfollowRappler campaign that saw a number of accounts supportive of Duterte following the directive. Rappler’s data also shows a surge in the use of the words "bayaran", "dilawan", and "bias" on social media. At its peak, the term "bias" was used in 30,000 comments in a single day. Within groups and pages Rappler monitored, almost 50,000 posts and more than 1.8 million comments used the term “bayaran”. A significant number of these were used in conversations about the media. Besides Uson, Laviña was also appointed to a key position in the Duterte administration. He served as deputy secretary to the Cabinet before being appointed chief of the National Irrigation Administration (NIA). He was eventually sacked by Duterte amid corruption allegations. Locsin, for his part, was appointed Philippine Permanent Representative to the United Nations in September 2016. 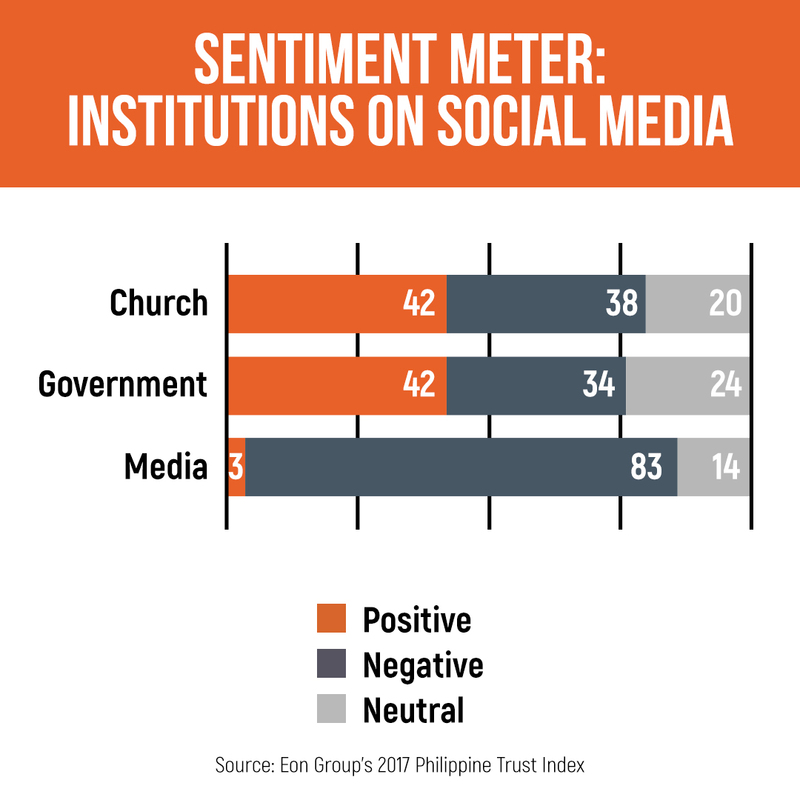 While there are legitimate issues that the Philippine media need to address – among them corruption, sensationalism, and inaccurate reporting – to a large extent, across-the-board generalizations about their shortcomings successfully turned public sentiment against them among social media users. This became evident in the results of the EON Group’s 2017 Philippine Trust Index study. While a 2017 survey by the US-based Pew Research Center showed that up to 86% of Filipinos believe journalists cover politics fairly, EON’s 2017 study found – when it looked at public sentiment and conversations on social media – that 83% had a negative sentiment toward the media. This is way more than the 34% negative sentiment against the government. 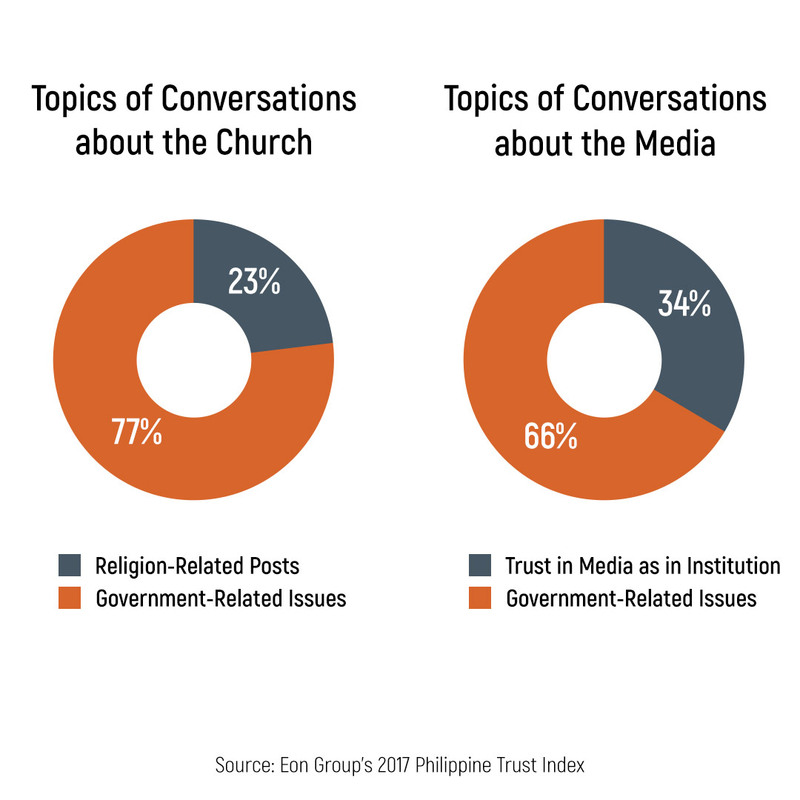 EON's study also showed that a majority of online conversations about the media involve government-related issues, often in the context of government personalities lambasting the media. This seeming groundswell of negative sentiment expressed toward journalists on social media continues to be complemented to this day by online attacks that come in many forms. Cyberattacks, such as Distributed Denial of Service or DDoS attacks and hacking, have been used against news organizations and journalists deemed critical of the President. 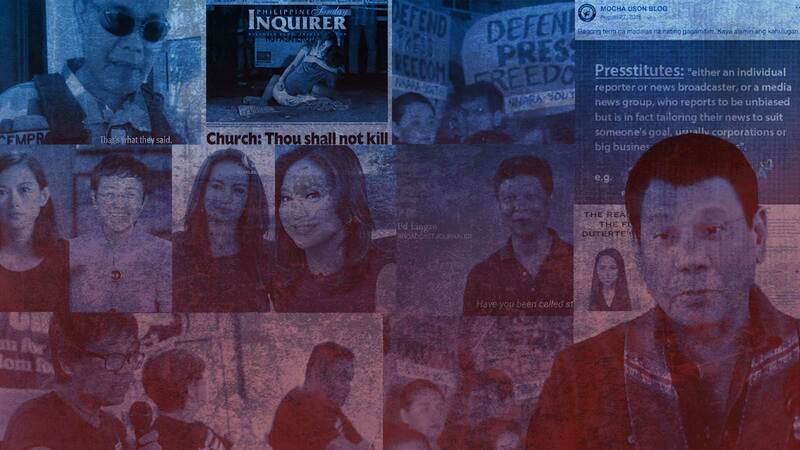 These online attacks come amid public tirades by the President and his administration against the media, as well as various attempts to use political power to intimidate and muzzle the press. The arrest of Rappler CEO Maria Ressa on February 13 comes as another blow to press freedom in the Philippines. The President has denied involvement but the case, filed by the justice department, came even after the National Bureau of Investigation had deemed it insufficient. Numerous groups, local and foreign, have tagged Ressa’s arrest as a troubling threat to press freedom in the country. No less than Canada, the UK, and the US have expressed their concern, reiterating that journalism is essential to democracy. The United Nations High Commissioner for Human Rights observed that the arrest was just an element to “a pattern of intimidation of a media outlet that has fiercely guarded its independence and its right to conduct in-depth investigations and to criticize the authorities." Local groups, meanwhile, highlighted the arrest as politically-motivated. Some, like the Mindanao Independent Press Council, pointed to the country’s libel laws as “archaic” and called for its decriminalization.